Each morning this summer, I’ve moved my office to a picnic table on the hilltop overlooking Common Ground’s lower campus. 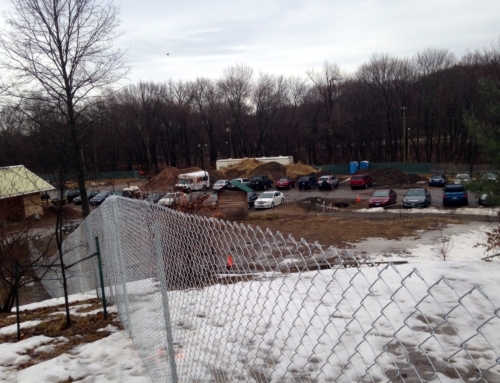 I am not alone in changing my daily routines so that I can take in the progress on Common Ground’s new building. 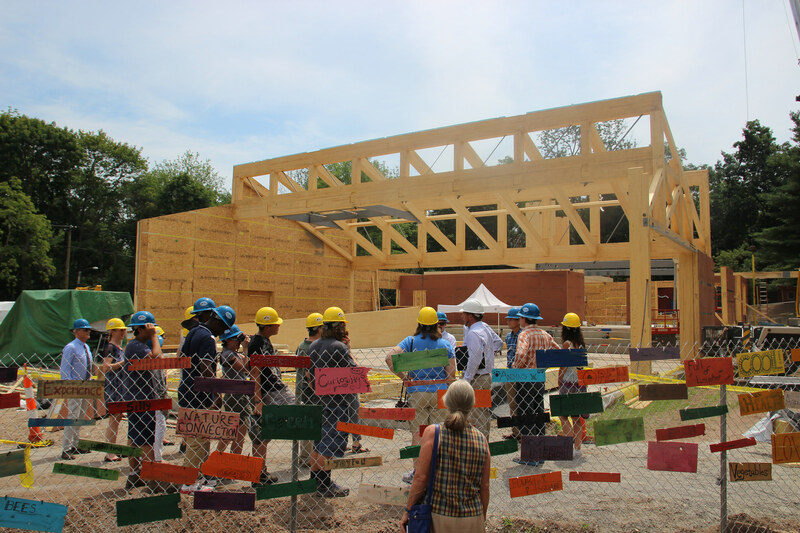 Summer camp families and high school students back for summer school can’t help but stop at Common Ground’s Harvest Pavilion, watching the crane lower a thousand pound wooden beam into place. 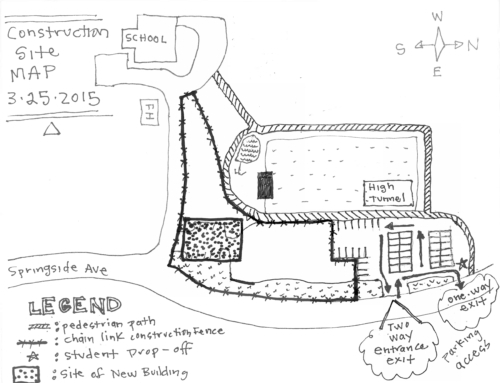 Teachers make special trips back, when they should be on summer vacation, to peer through the construction fence into their new sciences classrooms. Our Green Jobs Corps members pause from their work on a new butterfly garden, wetland bridge, and blueberry arbor to compare notes with the other team hard at work on our site. We are watching something beautiful, and significant, come to life on our campus. Students, staff, and supporters venture inside the construction fence for a hard hat tour of Common Ground’s new school building. This is a big moment for Common Ground — and it’s worth pausing to celebrate. In late July, about 5 dozen Common Ground students, staff, and supporters gathered on our campus to mark two huge milestones in the creation of our state-of-the-art, sustainable school building: the completion of fundraising efforts necessary to finish the project, and the launch of construction on the new school itself. 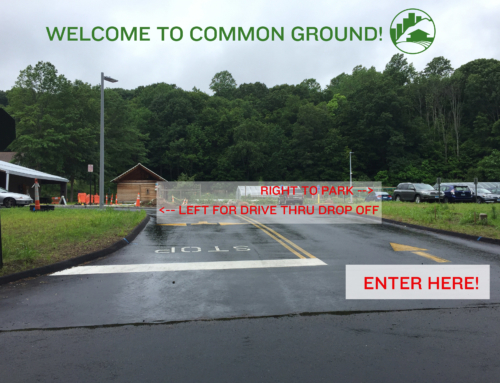 The first reason for celebration: at the end of the legislative session in June, the Connecticut General Assembly approved the final funding necessary to complete Common Ground’s new building. Public funding is being matched by $2.1 million in contributions community members, foundations, and local businesses. 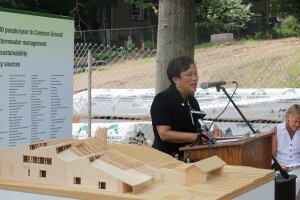 Mayor Toni Harp was a key advocate for public funding of Common Ground’s new school building. 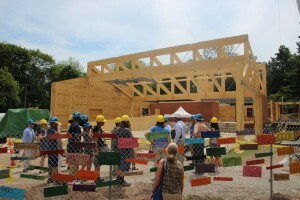 As a result of this public and private support, Common Ground’s new building has just begun rising from its foundation. 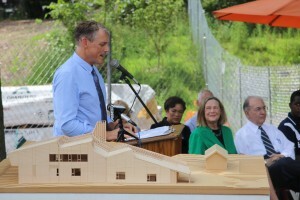 This new 15,000 square foot building on Common Ground’s campus will allow Common Ground to expand from 180 to 225 students, welcome more than 15,000 children and adults into the programs of its environmental education center, model innovative green building practices, and give students and community members a high-quality learning environment. 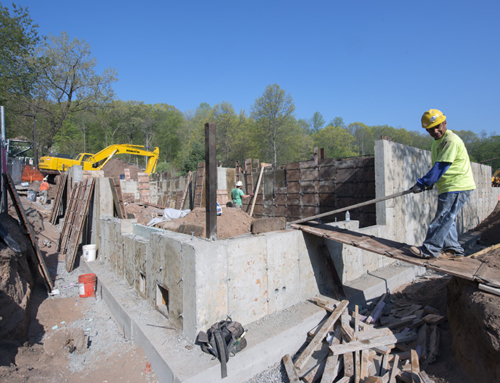 The building, designed by Gray Organschi Architecture and constructed under the management of Newfield Construction, aims to put Common Ground’s environmental mission into action. 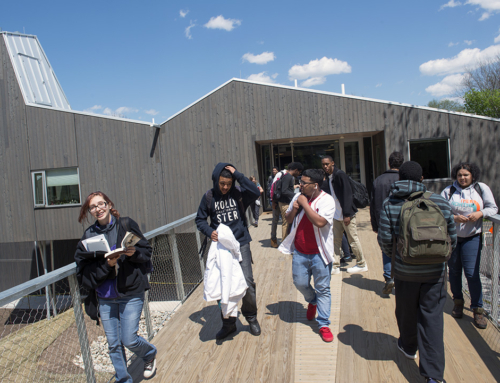 Alan Organschi, Gray Organschi Architects, describes how Common Ground’s new school building models sustainable building practices. 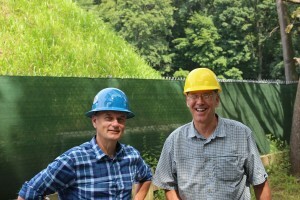 Ted Benson, the founder of Bensonwood, and Jean-Marc Dubois of Nordic Wood helped engineer and fabricate the innovative cross-laminated timber structure that’s at the heart of Common Ground’s new building. 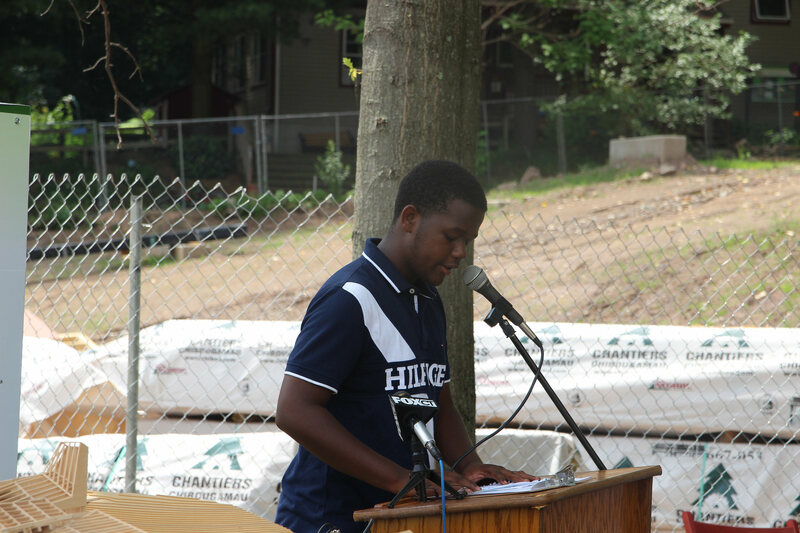 Common Ground sophomore Elijah Voss, a member of our Green Jobs Corps, describes visiting the New Hampshire facility where Common Ground’s building was pre-fabricated.